Iraq is in desperate need of a leader who is above sectarian politics. It may be an adage of history, although I am not aware of any comprehensive studies, that the greatest political compromisers are the largest of larger than life personalities in their communities. 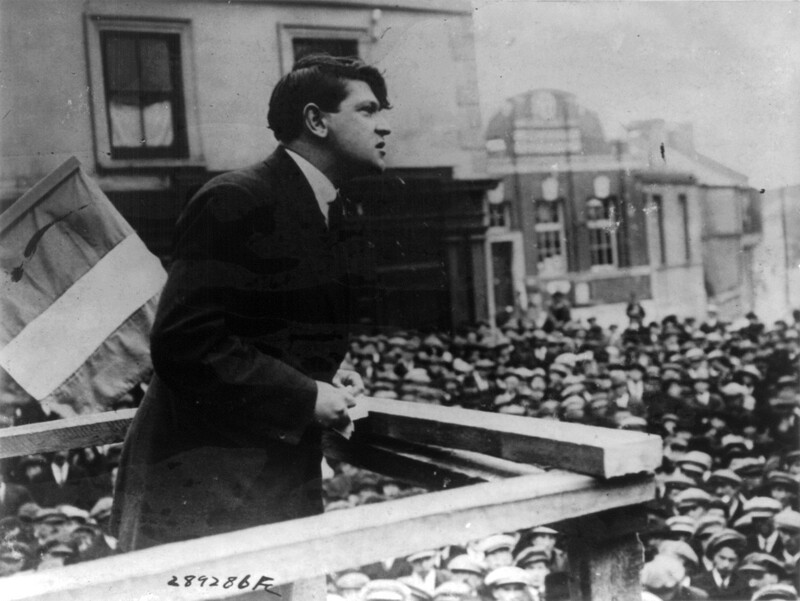 So it was fitting that Michael Collins was given the moniker of “Big Fella.” He was involved with Irish Republican underground groups in one form or another since he was a teenager, rose to the upper echelons of Sinn Féin to become Minister of Finance in the First Dáil (while also being principally responsible for covert action, arms smuggling and intelligence) and masterminded the IRA’s successful guerrilla campaign against the British during the Irish War of Independence. Despite his instrumental role in compelling the British to seek terms and decades of uncompromising defense of Ireland’s national aspirations, Collins’ legacy was one of pragmatism in confronting the reality that complete victory for his cause (at least in his time) was unattainable. Collins, chastened by the disaster of the Easter Rising of 1916 where outnumbered IRA members and allies waged a pitched battle against British forces in Dublin, determined that Ireland’s independence necessitated abandonment of conventional warfare. He helped organize so-called “flying columns” (akin to the Boer commandos during the Second Boer War in South Africa) to harass British forces in the countryside and created a counter-intelligence unit of assassins (the Twelve Apostles) to cripple Britain’s information gathering capabilities across Ireland. Britain, exhausted by the First World War, found itself increasingly dragged into a death by a thousand cuts irregular conflict for which it had little stomach. A delegation led by Collins and Arthur Griffith was invited to London by, among others, Prime Minister David Lloyd George and Minister of War Winston Churchill to discuss terms. Churchill made clear from the start that an independent Irish Republic, what Collins publicly campaigned for in the 1918 General Election and the basis of all his political and military activities up to that point, was out of the question. At a time when Britain was still recovering from the European war and with its position in the Middle East threatened, Churchill (also Colonial Secretary) would not allow the British Empire’s integrity to be an open item. Instead, London offered dominion status for 26 southern and western counties (an Irish “Free State”) with an opt-out for the six majority Protestant counties in the northeast (a portion of historical Ulster province). The Irish could elect their own government, but its members would have to swear allegiance to the British crown. This arrangement was advantageous for Britain, which preserved the Empire, seemingly forced the IRA and other paramilitaries to stop fighting and made security in the would-be Free State the problem of a locally-raised provisional army. Yet while the British were satisfied, Collins confronted a fatal dilemma. Although questionably not authorized by his superiors to sign an agreement without final approval, he believed (knowing the IRA’s rapidly diminishing strength) that a better offer might not be on the table for years, if ever. Lloyd George allegedly told the Irish delegates that if they did not sign the treaty, he would personally send a letter to British military representatives in Dublin urging them to prepare for total war. We may never know if this threat had any substance behind it, but what was certain to Collins was that no British government (no matter how liberal or conciliatory) would sign over full independence to Ireland. While agreeing to discrete territorial concessions he later regretted, he acceded to the core aspects of the compromise. Later, in a speech to the Dáil and voters during a referendum on the treaty, he would call it a steppingstone to the ultimate freedom — the freedom to achieve freedom rather than complete freedom in itself. Collins’ decision to sign the treaty, agree to partition and head up the provisional government of the Free State led to a year-long bloody civil war and his eventual death. To avoid giving the British an excuse to reengage directly and collapse the new government, he opened fire on the Four Courts in Dublin to clear it of IRA fighters (some of whom he previously led and considered brothers). The Irish Free State eventually yielded the independent republic of Collins’ aspirations for the 26 counties under its administration. Despite lingering tensions in Northern Ireland and resentment by core parts of the Republican community, Collins’ compromise gave the Irish most of what they wanted. Michael Collins should be regarded as one of the last century’s ideal military and political leaders in the context of conflicts over independence or territorial integrity. He came into his conflict with a clear vision of the future and what ultimate victory for his cause would entail, but recognized that bitter concessions would be required to achieve both. His decision not only to sign the treaty with Britain, but to defend it and what it represented (as well as the Irish majority’s support of its terms) against his closest comrades (he would remark that he supported it as nothing more and nothing less than what it was) took immense courage and eventually permitted Ireland to build its way toward what its people wanted. Ultimately, however, Collins’ decision was as much driven by his core values and belief in the democratic process (as well as some form of diplomatic fair play). Notwithstanding his leadership of a revolutionary movement and guerrilla army, he was a man of the West, educated and not overly given to petty tribalism that so often cripples attempts at resolving or managing internecine disputes. In contrast to Ireland in 1921, there is no pragmatic compromiser in the mold of Collins to be found in today’s wider Middle East to resolve its ongoing conflicts. In Iraq, the departure of American forces in December, 2011 gave way to an explosion of sectarian conflict spearheaded by the Shiite-majority Maliki government. Despite the official line of today’s analysts that Washington had secured Iraq on the eve of the troop withdrawal, American forces actually played a similar role to that of the British army in Northern Ireland in the 1970s and 80s — assisting with basic law and order and keeping Sunni and Shiite tribes talking to each other. The point is that the Maliki government before the American departure was a mirage whereas his government after the departure was real. The U.S. had achieved forced cooperation at bayonet point rather than genuine stability among leaders interested in making a unified, federal Iraq function. Maliki’s demented sectarian conflict with the Sunnis pushed otherwise anti-Baathist and pro-American tribes to alter their sympathies. As far as the elders of the some of the more influential tribes in Anbar Province were concerned, the U.S. had left Iraq to Maliki’s devices and failed to adequately reach out to (much less accommodate) them. Had Maliki rejected cheap sectarianism and opted for Collins’ pragmatism (i.e., accepted that throwing the Sunni out of Iraq or retaining them as second class citizens in a third of the country was impossible), Ramadi and Mosul would still be in his allies’ hands, the Kurds would not have taken Kirkuk’s oil wells and made side deals with Turkey on export of their output and Iran’s Revolutionary Guard and Shiite militias would not be propping up his successor’s government in Baghdad. ISIS and the de facto loss of two-thirds of Iraq was less a product of American weakness or President Obama’s inept policies than the Baghdad authorities’ abject failure to behave like a modern government anchored in reality. That otherwise moderate Sunni (including former officers of Hussein’s regular army) were willing to complement ISIS, despite knowing this organization’s aims and record, against the Baghdad government underscores just how badly Maliki erred. Only the raw savagery of ISIS killers on the ground convinced some Sunni factions to switch sides and contain the Islamist advance. Yet this change has not enhanced legitimacy for Baghdad, whose own forces have been chided by the U.S. Secretary of Defense as lacking the will to fight. Meanwhile, the great counteroffensive to retake Ramadi which Iraqi authorities have trumpeted for months has been given little chance of success. Whereas Collins had the support of his parliament, a majority of the Irish people via a referendum on the Anglo-Irish Treaty and a national army capable of using the money and weapons it received from London to defend the Free State against reactionary elements, the same cannot be said for al-Abadi in Iraq. Just last week he lamented his army’s loss of 2,300 Humvees to ISIS and called on the world to support him in a “long-term battle” against the group and its allies. This is not the rhetoric of a head of government with his house in order. Al-Abadi could be called the Haile Selassie of the Middle East, except that the latter confronted a modern, industrialized army from Fascist Italy while the former faces a patchwork of outnumbered irregular forces drawn in large measure from within his own country. As I have written on these pages, partition is the only realistic path forward for Iraq. The sense of betrayal among the Sunni is so deep that, even were ISIS defeated, reconciliation with Baghdad appears fanciful. Moreover, given the atrocities committed by Iranian-backed Shiite militias against anti-government forces, it is questionable how much control al-Abadi even has over those ostensibly fighting on his behalf. For the U.S., now, the only question is how to engineer a peaceful separation in the aftermath of ISIS’ military defeat. Such a division, if successful, might be just what the government in Baghdad needs to finally come to its senses. Not only Iraq, but Syria and most every other significant conflict zone in the wider Middle East lacks a Collins capable of forging a unified path toward compromise and genuine stability. In Syria, the national army is rapidly falling apart, with thousands of men avoiding conscription or fleeing the country. Unlike his father, whose rule was cemented with decisive action against his rivals, Bashar al-Assad has effectively farmed out his security to Iran and Hezbollah (which has sent thousands of fighters into Syria to the chagrin of its sympathizers in Lebanon). There have also been reports of secret talks and occasional double-dealings between Assad and ISIS as his troops lay prostrate. Assad is now playing Mussolini to Iran’s Hitler without an Alpine prison from which he could be rescued and rushed away to manage a puppet state. And yet in place of him there does not appear to be one man or force capable of uniting Syria against Iran or the Sunni Islamists. In short, Syria as an independent entity, like Iraq, has effectively ceased to exist and each side is too mired in narrow, sectarian hatreds to steer a peaceful, democratic path forward. Michael Collins, grounded in values we in the West are accustomed to, understood the difference between romanticism and realism — between being happy and being right. These values, and hence men of his mold, are sorely lacking in the world’s most troubled region. People with no background in democracy, conflict resolution across sectarian lines and putting national interests above tribal ones are ruling (or seeking to rule) exceedingly fragile and unstable countries. In many cases, their struggles with neighbors are less rational than visceral holdovers from centuries of conflict. It is an open question as to how many people living in Iraq, Syria and elsewhere in the Middle East today, other than a small group of elites (many ensconced in faraway capitals), actually view their conflicts in national terms. Until these basic contradictions are resolved, expect more bloodshed with little consensus about a way out.